Good habits can change your life. For example, drinking enough water can keep you hydrated and keep your smile healthy. Flossing your teeth at least once a day can keep your smile healthy. Going for a walk every day is a great habit to develop. If building good habits can positively impact your life, keeping up with bad habits can have a negative impact. There are several bad habits that can negatively affect your smile. We will just focus on a few of the most common bad habits that can affect a smile. 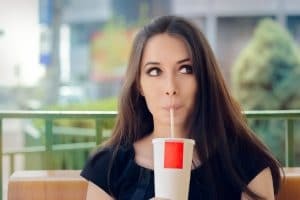 Your dentist in Lafayette, LA may be able to help you identify any bad habits that might be impacting your smile’s health. Chewing ice or other non-food items like fingernails, pens, or pencils can put your teeth and gums in danger. Chewing these types of things can become a nervous habit or something used to destress, but it can lead to injury. Hard, non-food items can cause tooth fracture or tissue damage to the lips, gums, or other soft tissues of the mouth. Chewing sugarless gum may provide a replacement for the chewing sensation in a healthier way for the smile. The American Dental Association recommends changing out a toothbrush every three to four months or until the bristles are frayed. Old toothbrushes can cause damage to your smile or breed harmful bacteria. Life can get busy and it can be easy to skip brushing the teeth before bedtime. However, it does not take long for bacteria left in your mouth to cause tooth decay. Skipping even just one session of brushing or flossing can set your smile up for tooth decay and gum disease. Once bacteria-filled plaque hardens into tartar, it cannot be removed at home. A related bad habit to skipping hygiene sessions is skipping routine dental appointments. Exams and cleanings should occur twice a year to keep the smile healthy. Do you have bad habits that affect your smile? A healthy smile takes daily commitment. To schedule a consultation, contact us at our office in Lafayette, LA at 337-237-6453. We proudly serve patients from Breaux Bridge, Broussard, Scott, Youngsville, and surrounding communities.